You can use it for hallways, doorways and stairway. 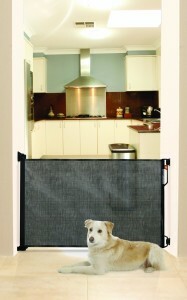 The gate is made of durable and sturdy mesh that is UV protected. When not in use, it is easy to retract to a slim and attractive window shade size that easily gets out of the way. It does not have any tripping hazard as it does not have a bar across the bottom that could cause the tripping. It latches securely taking only 30-minutes to assemble. It is also flexible in width that it covers therefore can be used in many areas. This gate comes with versatile mounting brackets which makes it easy to install at angles or on the outer or inner areas of openings and doorways. It is easily operated with one hand where you turn the knob to unlock the gate, and then use your hand or one foot to slide the gate off the hooks, and finally you retract it. Therefore you can be able to operate it while holding your baby in one arm. The gate extends up to 55 inches in length by 3 inches in width by 34 inches in h eight. It retracts to 34 inches in height by 3 inches in width. It weighs about 3.5 pounds.Perfect for kids under 2 years. This gate is a favorite for many parents who like how sturdy it is and the fact that it doesn’t have holes in it which may allow the kid to try to climb on it. The fact that the gate comes with 2 sets of mounting hardware and mounting brackets makes it easier to move and use it across two different locations. 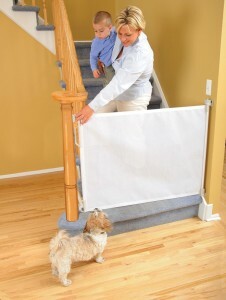 You may use it to block the entrance of a room and may be carry it downstairs to mount at the bottom of your stairs. The retractable design allows you to simply pull and mount the gate across a variety of angles and widths within your home. If you prefer to mount the gate at a space with a baseboard you can buy a Spacer Kit here. If you intend to install it on a flat surface either on the banisters or stair posts, get an Adaptor Panel Here. Most consumers feel that the one handed retracting operation is slightly noisy although this is corrected by operating it using two hands which is much quieter. However, some parents like the clicking safety sound because it alerts them to know if the gate is locked or open. The included mounting screws are best used on plasterboard and if you are mounting on hardwood it is important to get different screws. Many consumers have cited that the included installation guide is somehow confusing, but you can find a variety of online videos to use as a guide when installing the gate. 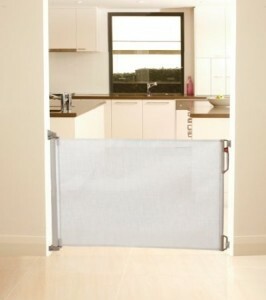 The gate has many positive ratings with consumers commenting about its space saving nature, how easy it is to install and the fact that it is an alternative to many cumbersome gates. This retractable gate has an average rating of 3.6 out of 5 stars. If you are looking for a gate with the ability to retract and be hidden away when not in use and not a big gate that swings around all the time, then this gate is worth mounting at your home. When compared to other retractable gates, this is a cheap bargain. Many consumers feel that the price is reasonable.